Happy anniversary. What a strange and wonderful trip this has been again. 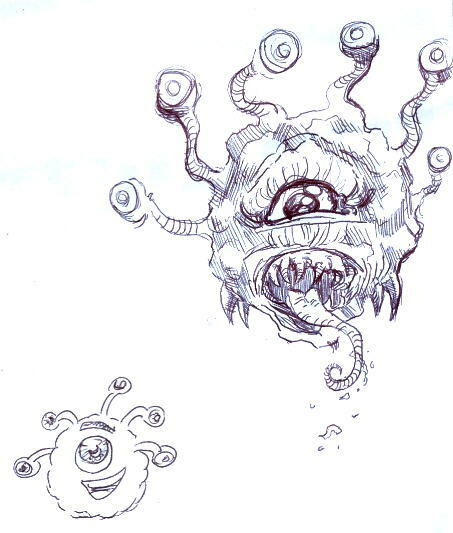 Obviously the Beholders are doing their “good cop, bad cop” routine. Happy Anniversary! Congratulations on seven years, Mike, and for consistently interesting daily posts about comics. Awesome 7 years Mike. Congratulations and here is to many more! I raise my cup of morning coffee to you! Hey, you’re one of my blogging heroes. Plugging it out every day. Congrats. Thanks again for your daily posts… yours is one of the first blogs I read, and it remains the first blog I hit. Keep up the great work! You are an inspiration to us all, old man. Happy Anniversary, Mike! Do you get parole after 10 years? Thanks for making the mornings before work at least a little bit more tolerable, Mike! You’ve no idea how much I’ve appreciated the chuckles and genuine laugh out loud moments your writing has created. Keep it up! Happy blogiversary, Mike! We all love you! Yes, even that guy. Congratulations! I thank you a thousand times and will never forget my favorite post ever – your obsessive over-analysis of that Richie Rich cover. I laughed, I cried, I peed my pants. Congrats, Mike! Here’s to many more years! Awwwww, who’s a widdle behowder? Is it you? Is it you??? I’m just amazed that it’s been SEVEN YEARS. Time really does fly when you’re having fun! Anyway, Happy Blogoversary Mike. Keep up the good work! You’re awesome, Mike. Keep up the good work! I’ve been here the whole time Mike, and I’ve enjoyed all 7 of them. Always entertaining and a joy to read. Happy Anniversary Mike!! Thanks for all the yuks! I’ll keep reading as long as you feel like doing this.